In my teaching days I’d often hear moans and groans coming from students when they learned of their failure on a test. What usually followed their whimpers of dissatisfaction was a litany of excuses as to why they did so poorly. “30 minutes while I was watching TV” (or something like that was the typical response). I worked in a Christian school so it was typical for us to pray during the day. I always prayed before tests just to calm the atmosphere and help kids get their mind focused. The Bible says in Psalm 62:12 that God renders (gives, provides, supplies) to each of us according to our own work. It doesn’t say what He gives whether that’s money, daily provision, authority, friendships or whatever. The implication though is that it’s something we deserve. And that “something we deserve” centers on our work. Based on my work, not the work of someone else. The blame for failure rests with me. It results from my inability to pursue tasks with the necessary fervor. Will there be circumstances where you are putting in maximum effort and situations don’t work out how you planned? You can’t account for what others in the company are doing that may cause it to falter. You can’t win if other key members of the team aren’t putting in the same effort. You can’t anticipate what unforeseen events might come your way or that someone might simply be better than you. But this is an undeniable truth no matter what circumstance you find yourself in…you can’t succeed if you are putting in minimal effort to just slide by. 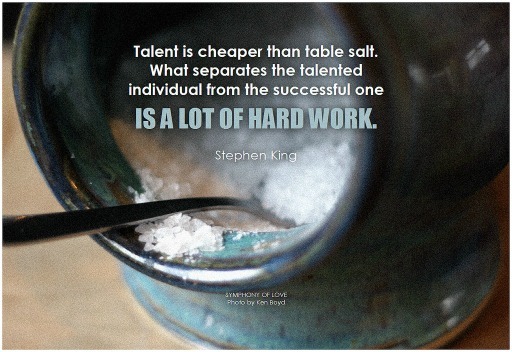 Your work ethic is the key, determining factor in being given what you deserve. You can’t expect to reach great heights without being willing to do the climbing. Questions: How have you seen your dedication to work pay off – either in a negative or positive way? Do you routinely blame people or circumstances for why you fail? Do you feel others are holding you back? How many times, in the course of my accounting career, did I hear my clients blame their financial reverses on “bad luck,” when their own foolish spending habits were at fault! The principle of Psalm 62:12 applies to all of life. To Robert Green Ingersoll is attributed the maxim that “in nature there is neither reward nor punishment…there are only consequences.” So true — and the sooner our children learn that truth, the greater the likelihood of their success. So glad I stumbled onto this site, brother Brian! Grace and peace be with you. Thanks Michael. It’s easy to point to outside influences as being the problem. I agree that, in reality, we are more to blame than anything else. “…doesn’t always put the work in.” That’s the key Tre. Little work will only lead to little reward. I see this attitude even with adults at work. Some expect raises and promotions, despite not putting in long hours or turning in top notch work. Some people think just showing up day after day is enough to be rewarded. When I was a flight controller at NASA, one thing we hammered home to the new controllers was that you have to accept responsibility for everything. Sometimes it’s not entirely your fault, but laying blame on others is poor teamwork and is no way to operate in a life-or-death environment. I have to admit it was completely unnatural for me, but it’s a lesson I’m glad I’ve learned. I think that mindset has served me well in my career, has helped me build rapport with my project teams, and has helped my management trust me further. “…laying blame on others is poor teamwork…” Completely agree Kirsten. You win and lose as a team. It really depends on the situation. But most of the time, I blame myself but that that much, not to the extent that it would affect my performance or work habits. I just forgive and forget. There are more days to catch up and make up so why would I still spend time blaming myself, when I can make it right now or at that moment. It’s all in the mind and be positive. I love your prayer for students. 🙂 There have definitely been times when I put in an incredible amount of effort into a goal or project and it didn’t turn out well. Obviously, those times don’t make me happy but when I can remove myself emotionally, I almost always learn something too. I also know that I have never succeeded without doing the work either, which is also keeps me motivated to put in my best effort. SO true, Brian – right on the mark here. Especially with God as my guide, I find that the harder I work – especially at hearing His guiding voice on how to handle something – the better results I have. This is one of the things I speak to my children about all the time. I tell them be consistent in your level of effort no matter what you are doing, school work, sports, etc. Always give it your best effort and attention. If you do that more often than not you’ll be successful. Absolutely! When I realllly want something I know I’m capable of achieving it I’ve done it many times in my life from getting a job Ibhad zero qualifications for to getting into the school I want by convincing them despite not having all the pre-requisites I would succeed (which I did). I’ve also had failures which i recognize as my fault…weight loss being the first to come to my mind. I realize 100% that the reason (despite my frustration) that I haven’t lost a single pound in the last 2 months is my lack of motivation. Eating is well but my fitness had declinedm.I can’t blame anyone but myself!